We had a beautiful sunny day for this year’s Australia Day celebrations and Pioneer Park was full of colour and activities for the appreciative and diverse crowd who attended. The official party arrived at 10:30 am and were led in by the Berwick Pipers and Air League cadets. The official party consisted of Mayor Councillor Amanda Stapleton, Councillor Susan Serey, Mayor Emeritus Sam Aziz and his wife, Jason Wood MP, Australia Day Ambassador Sue Stanley and President Geoff Double. The proceedings got under way with the Air League cadets raising the national flag. The official party then gathered in the Bill Minns’ rotunda, where young Lucinda Da Silva provided a stirring rendition off the national anthem. MC Ricardo Balancy invited Mayor Amanda Stapleton to the microphone. The Mayor began by welcoming everyone to this community event to celebrate all that is good about Australia. She stated that “Today, we reflect upon the events of our modern Australian history, which have shaped our democratic nation. Australia is a nation made up migrants and together with others, we are all Australians united by the common values of decency, fairness and mateship. We all live in a peaceful and vibrant society of which we can be proud”. Amanda referred to a special function to be held at Bunjil Place later in the day to recognise outstanding efforts of individuals and community groups through the City of Casey 2019 Australia Day Awards. 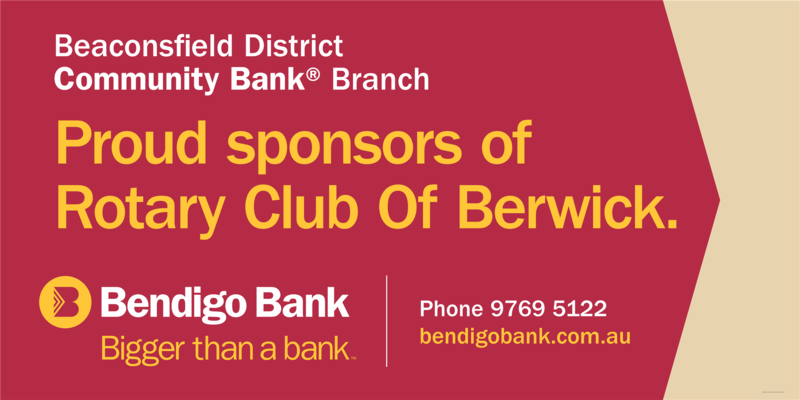 The Mayor concluded by thanking the Rotary Club of Berwick, the Inner Wheel Club of Berwick and all those who made this wonderful event possible. Australia Day Ambassador, Sue Stanley, got the crowd active with some aerobics exercises before her inspiring presentation. Our Australia Day Chairperson, Isobel Caulfield participated in this activity with enthusiasm. President Geoff thanked Sue after her presentation and presented her with the official Australia Day Ambassador’s pin. This was followed by Jason Wood MP presenting several La Trobe Community awards to outstanding local residents. There was a wide range of food vendors providing everything from paella to doughnuts and coffee. Despite this, the Rotary Club’s barbeque was kept busy coping with the demand for sausages in bread, with onions as an optional extra. However, those wanting onions made many references as to where the onions should be placed, above or below the sausage. The ladies of Inner Wheel who were situated directly opposite the BBQ, were usually the next stop for accompanying drinks or icy poles. The two horse drawn carriages again proved popular and they were kept busy all-day, providing rides for families. Thomas the Tank and other amusements were also popular choices. Other displays included vintage cars, wood choppers, face painting, fire engines, Australian animals, whip cracking and army reserve. Entertainment was provided by Kazoo and the celebrations continued until 3:00 pm, after which the job of packing up began. 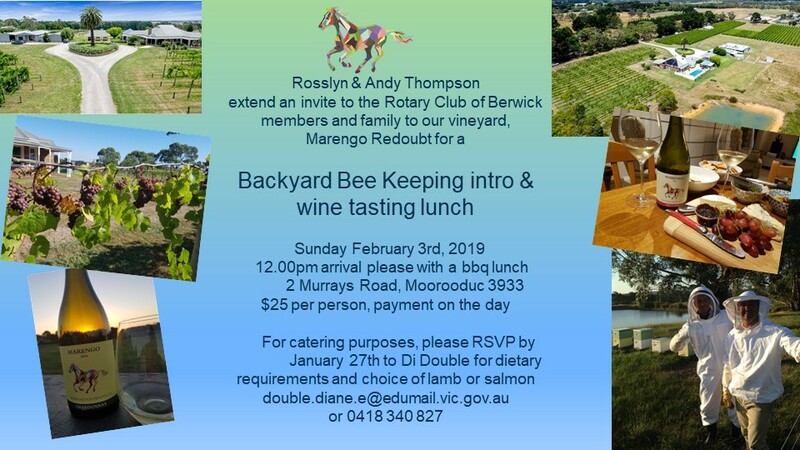 Rotarians, Inner Wheel ladies and other volunteers then retired to the home of Jack and Ann Kraan to have well-earned drinks and fellowship to celebrate another successful Australia Day event. PE Isobel Caulfield, Chairperson of the Australia Day Organising Committee, thanks everyone who worked so hard on the day to ensure its' success. Rotary members are committed to creating a peaceful world. Sixty million people across the world are displaced by armed conflict or persecution. Ninety percent of armed-conflict casualties are civilians, half of them children. 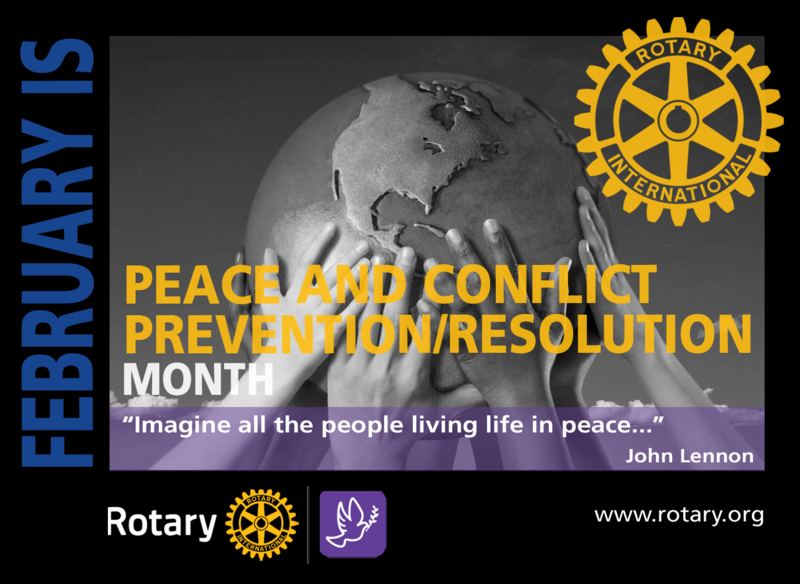 During February, Rotary Peace and Conflict Prevention/Resolution Month, we’re celebrating our commitment to build peace and mitigate conflict. February also includes the anniversary of the first meeting of Rotary held on February 23, 1905. Through service projects, fellowships and other Rotary-sponsored campaigns, Rotarians train adults and young leaders to prevent and mediate conflict and aid refugees who have fled dangerous areas. Each year, up to 100 Rotary Peace Fellows are selected to attend Rotary Peace Centers to participate in master's degree programs at one of its partner universities. Fellows study subjects related to the root causes of conflict and explore innovative solutions that address real-world needs. Rotarians also pursue projects to address the underlying structural causes of conflict, including poverty, inequality, ethnic tensions, lack of access to education and unequal distribution of resources. • Supporting studies related to peace and conflict resolution.